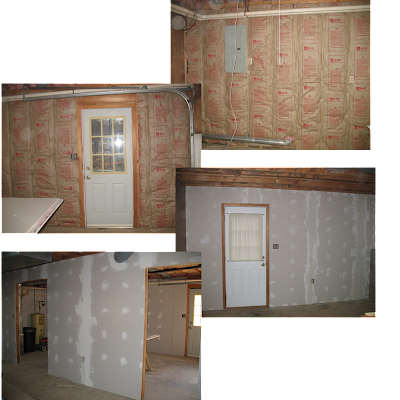 Our first project (after we got settled in) at our new house was to finish out the basement. Our basement boasts a a one-car garage bay plus a work/storage space in addition to a laundry room and den on the other side. 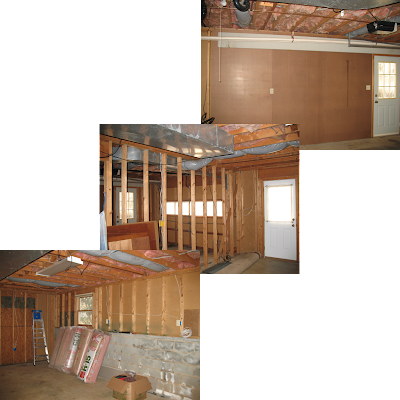 The unfinished garage started as a blank canvas with unfinished open stud walls, concrete floor, and an exposed ceiling. The dark, dirty room was not a welcome greeting when we got home. And at night, it was just plain scary-- the single exposed light bulb did not inspire visitors to linger long. We decided to tackle the project with help from our handy families. My father and I added a new opening in the divider wall to more easily navigate around the car, additional electrical outlets, and three new fluorescent light fixtures. Michael and his bro, Nelson, installed the insulation in an afternoon. Bless them! Next came drywall, peg board, and a ceiling. After a week of mudding and sanding drywall, we added trim around the doors and gave the whole room a coat of fresh white paint. Then the simple tile ceiling went up with furring strips and molding finished the edge of the room. Lastly, we sealed the block wall with two coats of Dry Lok to prevent moisture from seeping in and followed up with paint to complete the room. 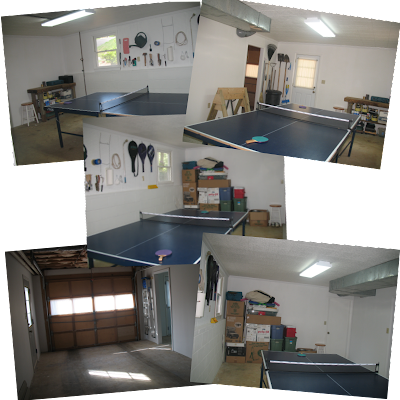 Now, our basement is a bright and tidy place to work, play, and store things. Future upgrades may include painting the garage door and metal air ducts, a drop ceiling in the garage bay, a painted faux tile floor, shelving for the storage boxes, and cabinetry for all the paint, tools, and supplies.